Posted on October 16, 2013 by Guillermo R.
American Airlines will begin flying a new Dallas Ft. Worth DFW – Hong Kong HKG route using its new 777-300ERs and launch a new service from DFW to Shanghai PVG using its 777-200 starting in summer 2014. American is cutting its flight from New York JFK to Tokyo Haneda. All of the new routes are subject to government approval, so start dates and flight times are yet to be nailed down, but the team at American is operating under a fair amount of certainty that they will be approved. All in all, I think this is great news not only for Dallas, Miami and New York-based flyers but for all American flyers for a few reasons. Now that American has an option to fly from Dallas to Hong Kong, that should open up some more award availability and Executive Platinums will be able to use their EVIP’s and upgrade more cheaply than if flying Cathay. It’s true, Cathay’s 777-300 first class still beats American’s hands down in my opinion. Cathay’s 777-300 only has 6 first class seats, so you get extra attention, and each is between 80-87 inches in pitch and is 36 inches wide with a 17-inch screen as well. 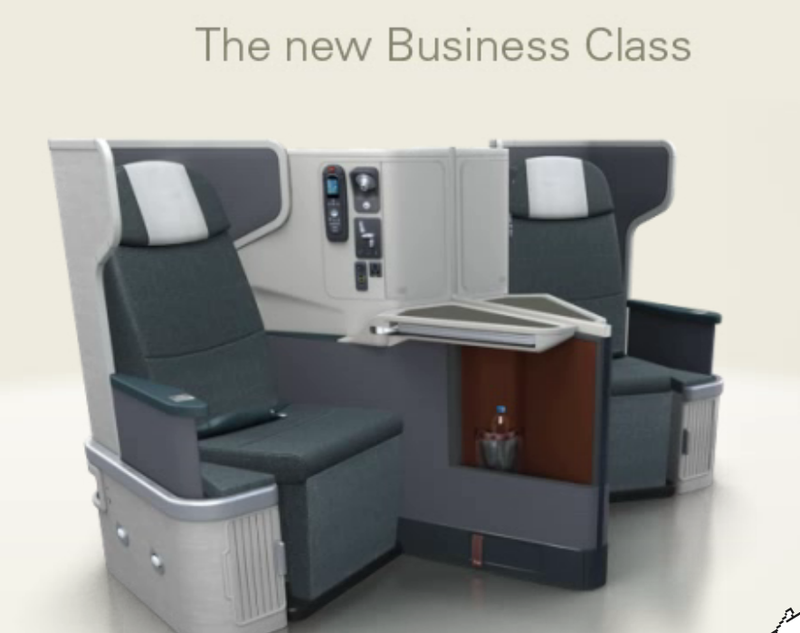 Their business classes are comparable and have the same layout though I’d consider the service in Cathay to be superior. 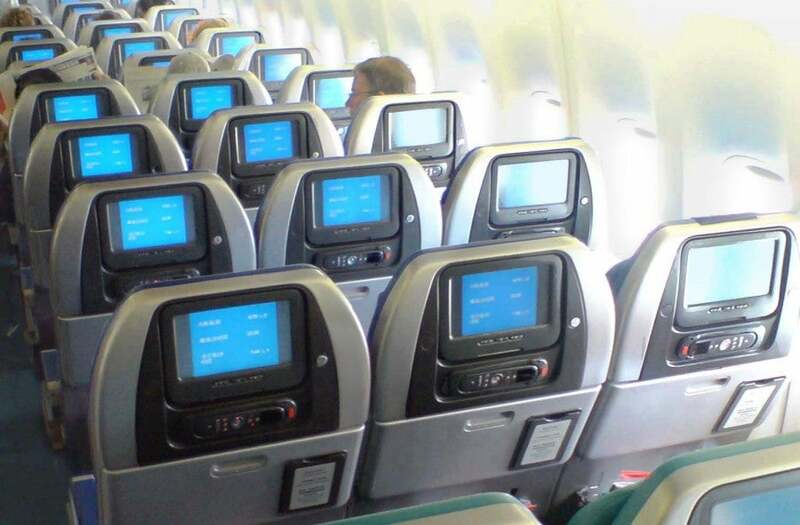 In American Business Class there are 52 seats in 13 rows of a 1 x 2 x 1 reverse herringbone configuration. The lie-flat seats have a pitch of 75 inches and are up to 26 inches wide with the armrests down. 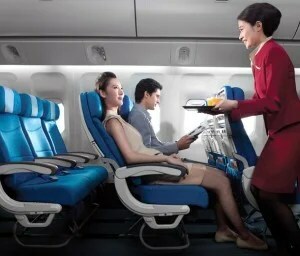 Cathay’s cabin has 53 business class seats, which recline to 75 inches as well and are 21 inches wide. 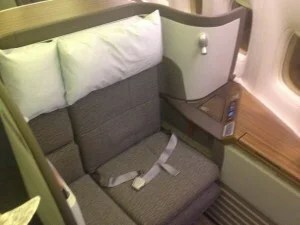 Cathay also has a separate premium economy section, which American does not, though American has its Main Cabin Extra seating on the 777-300. 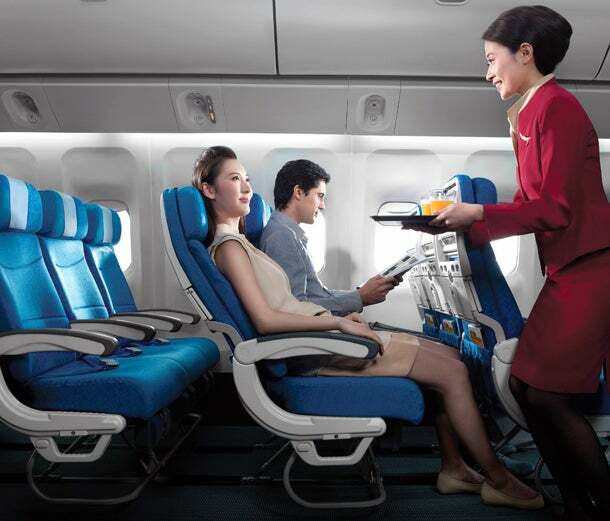 Cathay’s Premium Economy section is just 34 seats with 38 inches of pitch and 19.5 inches wide. While American’s Main Cabin Extra has just 36 inches of pitch and is 18 inches wide – not really a comparison here. In Economy, Cathay also excels. American squeezes in 220 seats in a 3 x 4 x 3 configuration and each has 31 inches of pitch and is 17.5 inches wide while Cathay’s economy section is slightly roomier with just 182 seats, each with 32 inches of pitch and 18.5 inches wide and in a more comfortable 3 x 3 x 3 configuration. Cathay’s economy cabin is roomier. Dallas will also get a new Shanghai route that will leave around 10:55 am local time and arrive in Shanghai around 2:55 pm local time (or so the plan goes), which is great news for passengers connecting from Latin America and the east coast who won’t have to then transit through Los Angeles or spend a long time laying over in Dallas. By comparison, the LA flight leaves at 1:20pm and arrives at 7:20pm, and the Chicago-Shanghai flight leaves at 10:35 am and arrives at 3:05 pm, so this new flight is a good option for folks who can’t make it to either of the other gateways, or who want to get to Shanghai earlier on in the day. The one not-so-great piece of news? That this route, like the other Shanghai routes, will be serviced by the old 777-200, so it’s got the old first class and angled lie-flat business class seat. There were two bits of news on the London front. 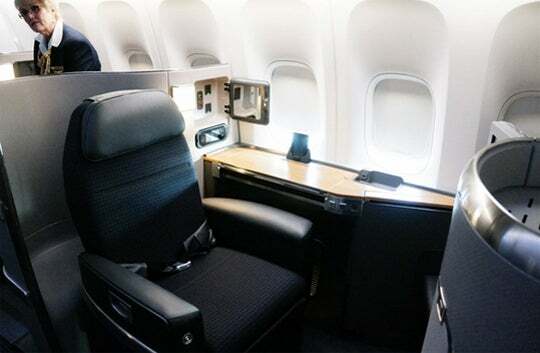 The first is that American plans to start operating the JFK-LHR route exclusively with 3 daily flights aboard its new 777-300ER’s – so all new planes and all lie-flat seating in the premium classes. One of American’s day flights will actually be a codeshare with British Airways, who will operate it while American retrofits its 777-200′s with the new interiors starting in the first half of 2014, and then those planes should come online and start operating with the same seating as the 777-300′s. 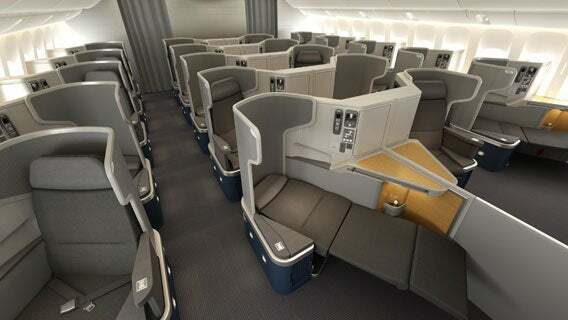 All American’s JFK-London flights will feature the new lie-flat business class aboard 777-300s and retrofitted 777-200s. Not only that, but American plans to introduce a 777-300ER into service on its Miami-London route as well, so flyers out of that hub have something to look forward to, and as a Miami-based flyer myself, I’m looking forward not only to that (no more transiting to New York to get aboard a new plane!) but also the new route aboard a 777-300ER that American plans to introduce from Miami to Sao Paulo. The one casualty is the JFK-Haneda Tokyo route. I can’t say I’m that surprised since it was slotted in at an inconvenient time and a lot of people were still opting to fly to Narita even though it’s farther away from the city because of the more choices of connections through there, but I’m still a little disappointed. However, there are still plenty of options to get to Tokyo, not only aboard Oneworld partner JAL, but also from Los Angeles, Chicago and twice daily from Dallas, so for folks looking to travel to Japan or transit though, there will still be plenty of award and upgrade availability. There are still some government approvals that need to be confirmed before all these new routes go into operation, but it sounds like they are pretty locked in, so I would count on them. 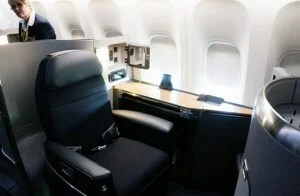 Even better, there will possibly some mileage bonuses on the new routes based on recent history where American has offered double miles and other bonuses on new routes both domestic and international, so hopefully there will be plenty of chances to rack up a ton of miles as these new routes come into service. 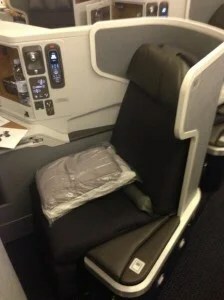 This entry was posted in Uncategorized and tagged #airtravel, #awardbooking, #awardbookingservice, #awardbookingtips, #awardmiles, #awardtravelpoints, #bestcreditcardbonuses, #bestcreditcards, #besttravel, #bestwaytotravel, #frequentflyer, #frequenttravelrewardsprogram, American Airlines, Business class, Cathay, Cathay Pacific, Hong Kong, New York City, Shanghai, United States. Bookmark the permalink. ← 10 ideas and fun things to do in Rome!